Looks can be deceiving. Those four words can be a powerful message – and for anyone that falls victim to it, it can be a tough lesson to learn. My latest example of this is my time spent with Deep Ones. My only prior knowledge of this game was a short video of the first ten minutes of gameplay. It looked poor, but I was intrigued to know just how bad it could be. Even when starting my own initial playthrough, I realised this isn’t a good example of how games used to look, and is a bad recreation of those classic ZX Spectrum games. Some would even say it looks primitive compared to the games it tries to emulate. But after about an hour a smile grew on my face. I was having fun. 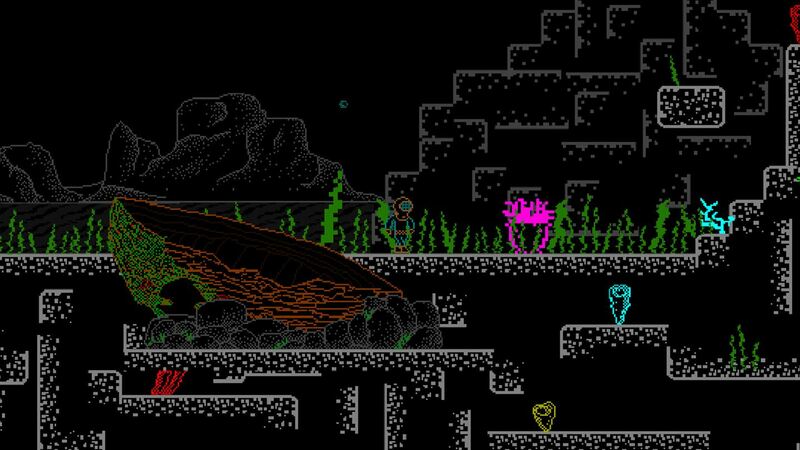 Let’s not beat around the bush though, Deep Ones is not a good-looking game. Whether it is its failed attempt to look like a Speccy game, the bad English translations visible in the Achievement descriptions and in the small amounts of text on the screens, or the painful to listen to sound effects, Deep Ones could have received a different review entirely. And the fact that it is enhanced for the Xbox One X and 4K is almost laughable. But as I said, looks can be deceiving. To combat the sound effects, the soundtrack is pretty decent. Weirdly, it doesn’t fit in with the rest of the Speccy aesthetic and is a much more modern affair. Still extremely synth-laden, but without any 8-bit sound chips. Instead, they are saved solely for the sound effects – which fit in with the look of the game – but are akin to nails on a chalkboard, particularly when a barrage of cannon fire occurs during a boss fight. 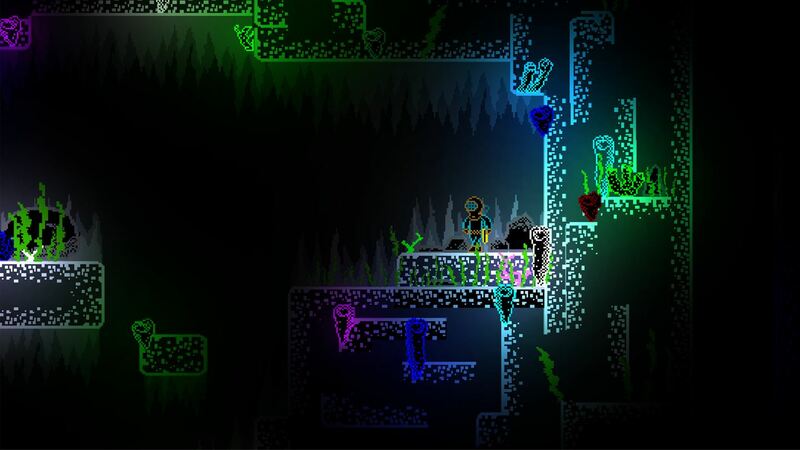 Deep Ones is, at its core, a 2D platformer. 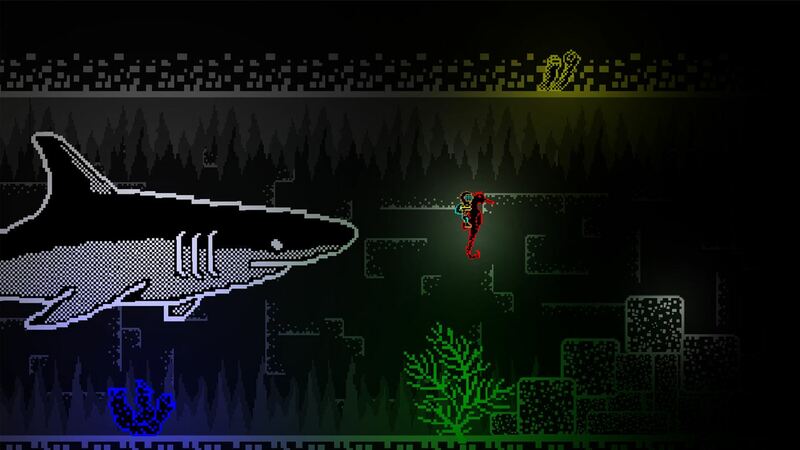 You play as a diver whose submarine gets nicked by a giant octopus. Rather than admit defeat, the diver heads down to the ocean bed to get it back. 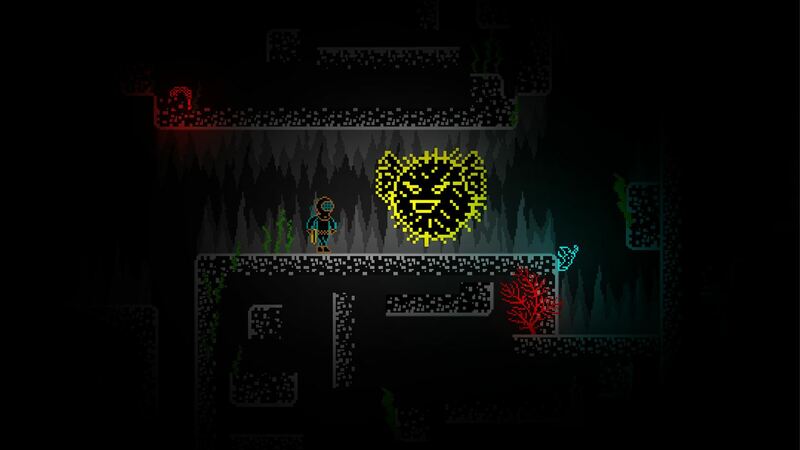 Throughout this journey the diver needs to avoid poisonous plants, turtles, and crabs, whilst utilising stingrays and seahorses; typical sea creatures all feature in the game and their specific uses are original to see. The second half of the game features the diver escaping from a crew of undead pirates, before assisting them as they themselves flee from a larger horde of undead pirates. Thankfully though, early on you pick up a harpoon gun to help dispatch of the enemies. You don’t always have access to it though, and sometimes all you have is a sword. These sections are easily the most infuriating. You are granted extra hit points – five instead of the standard three – to combat this, but it is still is not enough. I will admit, to defeat the boss that features during the first sword section I had to get him to glitch on a platform so he was in a suspended falling state to allow me to slash away. Yes, glitches are also present in Deep Ones. Along with the boss constantly falling, frequently during the early part of the game I would need to spam the ‘X’ button just to get a shot off with my harpoon gun. However, this happens less often towards the end of the game – for some unknown reason. Another, more serious glitch that resulted in me choosing to glitch the sword boss is in concern with the dash/dodge move granted to me during these sword sections. Firstly, I only discovered this due to an icon in the top left of the screen that suddenly appeared, as it was not explained at all why it was there, or indeed what button to press (LB or RB by the way). However, whilst RB worked in allowing my character to dodge away to the right, the left bumper 90% of the time also sent my character to the right, not the left! All in all then, I felt vindication for getting that boss stuck on that platform. There is another boss towards the end of the game that equally should have given me trouble, if that was not for another glitch I utilised that prevented it from hitting me at all. I can’t help but feel that these could, and should, have been discovered during development simply by doing a little extra QA on the game before release. Conversely to this, the shark boss that features early on, I found to be a clever one. A school of sharks comes across the diver and attempts to eat him, swimming above him in a circle. One-by-one they come down and attack and it is up to you to figure out their attack pattern and shoot accordingly. This is one of a few set pieces in the game I found to be enjoyable, if you can get over the irritating controls. The Achievements are all very easy in Deep Ones, only requiring one full playthrough and a partial second one to unlock all 20. I would have all of them if it wasn’t for… yes, you guessed it, another glitch! This one requires you to defeat the pirate boss three times – one playthrough includes two fights against him – but on my third battle the achievement didn’t pop. It all seems to be trial and error as to whether it unlocks, but it doesn’t take too long to get to this point should you choose to try again. In fact, Deep Ones doesn’t take long at all to complete. One playthrough takes around four to five hours. Which is just as well seeing that it only costs £3.99. For all its knocks and criticisms, I had fun playing Deep Ones. The relatively short length means the game doesn’t overstay its welcome and for the price of a pint in the city centre, you could do far worse. It’s a rough and ready release in need of an update or two that playtesting thoroughly beforehand would have negated – such as the easy to discover boss glitches, dodgy English translations throughout the game, and overall button inputs – but I enjoyed it nonetheless. It’s a game I would recommend to old-school gamers and Achievement hunters, but also to those with access to music whilst playing, if not to simply drown out the sound effects. You could try turning them down in the menu but with how other things have/haven’t worked in Deep Ones, this may inadvertently turn them up. Previous articleThe first of April’s OG Xbox games have arrived on Xbox One via Backwards Compatibility – but which should you head back to first?